Our church building is loved by our visitors and is especially well cared-for by our members. It was consecrated on 11th February 1868, by the Bishop of Salisbury. Its story began long before that. We hope you will enjoy a visit sometime. 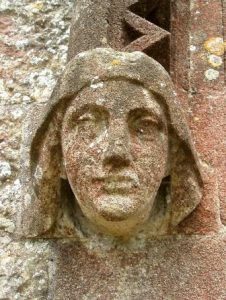 There has been a church in Compton Abbas since Saxon times, when this village belonged to the Abbess of Shaftesbury. Originally, the church was in East Compton, at one end of the parish. By the mid 19th century, however, the old thatched church was in very bad repair. It was decided to replace it with a new building in a more central position, on the newly opened turnpike road – now the A350. There is a picture of the old church in the porch. 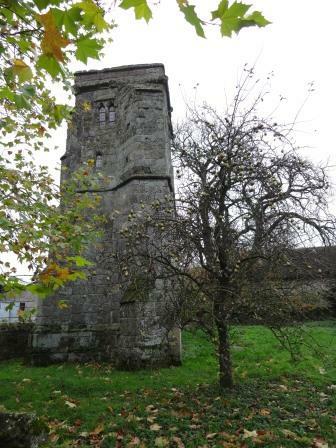 Its tower still stands in the old churchyard and can be found by turning right out of the car park and then, almost immediately, right again down Chapel Hill. It is about a quarter of a mile down the road, on the left hand side. A considerable amount of stone from the old church was used in building the new one. The rest came from the quarry at Whitehall, on the main Shaftesbury road. The local landowner, Sir Richard Glyn, gave the land for the new church and £1,200 towards the total building cost of £2,430. Two of those bells hang in this church today and are regularly rung before services. The oldest bell, inscribed Maria is thought to date from 1500. If it does, it must have survived the reigns of Henry VIII and Edward VI when many ancient church bells were seized and melted down. The second bell from the old church is inscribed Remember God ID 1624. The other three are dated 1875, 1897 (commemorating Queen Victoria’s Diamond Jubilee) and 2002. 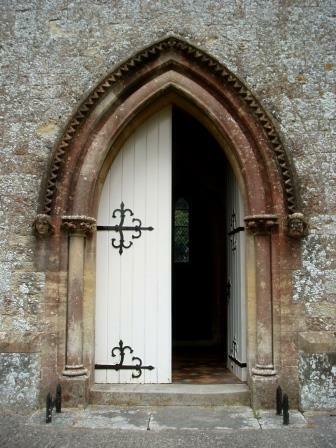 The stone font by the door also comes from the old church. For almost a thousand years it has been used to hold water for the baptism of new Christians. 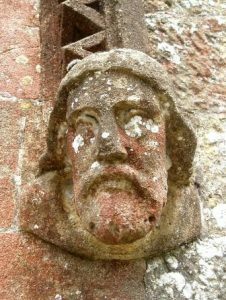 When it was brought here, it was recut, given a new pedestal and placed in the traditional place, at the entrance to the church. He whom this spot marks was the shepherd of his people. Thomas was his name, Lawrence his surname. He was blessed with a wife and eight children. He cries to us: take no heed of life or death, for I tell you that in dying I shall be alive, just as you in death shall live. So to you, with Christ, be glory, life and salvation. We celebrate our life with Christ in the service of Holy Communion, when we share bread and wine which are consecrated on the altar. Our altar frontal was designed by Revd. Maurice Strike, then vicar of Corfe Castle, and worked by Ruby Lever. It was commissioned by Revd. John Schofield, a retired priest living locally, who also made the wooden chest decorated with flowers, which holds other altar frontals. On the eagle-shaped lectern at the foot of the steps is the Bible, which is read at every service. The carpet behind it carries an appropriate message; its design refers to Psalm 119, verse 105: Your word is a lamp to my feet. The kneelers hanging in the pews are a reminder that prayer is central to the life of the Church. Over twenty local people chose and embroidered their own designs within a common border. mother of Jesus. The background shows Compton Down, the old church tower (with the pear tree which grew on top of it for many years) and the preaching cross which stands next to it. On the Down are pale streaks commemorating the moss gatherers who rolled moss downhill, making it into balls which they sold to florists in London. The side chapel altar was stolen in 1998. 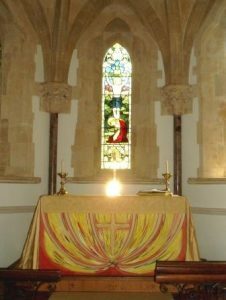 The present altar was made as a replacement by the Revd. John Schofield. Above the altar hangs a sanctuary lamp from India. It originally hung in a Hindu temple in Sunai, near Mumbai. When the villagers were converted to Christianity, they gave the lamp to the missionary, asking that it should be converted too. The carpet below the lamp shows the emblem of the World Council of Churches. It was made by local people, as were the hassocks in the chapel pews, which show the old names of the village fields, and the flowers which grew there. 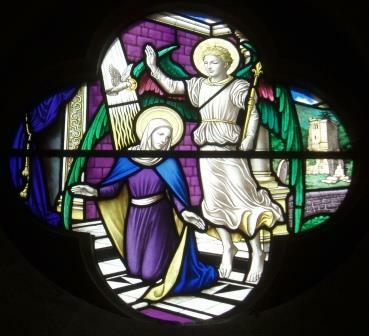 The wooden panels under the chapel windows are carved in memory of people with strong connections to this church and the screen which separates the chapel from the main church was put up in the centenary year, 1968, in memory of a past vicar. 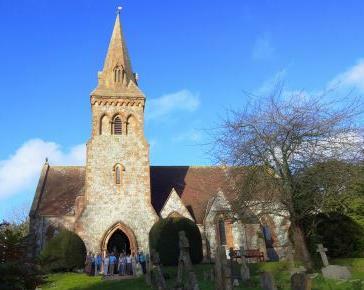 This year we celebrate the centenary of our Village Church. We thank God it is still standing after all these years. The secret, of course, is in the foundations, and in the fact that people have cared for it all this time. But the real Church in this village is not the building, but it is made up of you and me, “fitly framed together”. So each generation is called upon to lay the foundations of the future Church in their own hearts, and home, and village way of life. Remembering always that:- “other foundation can no man lay than that is laid which is Jesus Christ”. There is a prayer board at the back of the church. If you want to ask for prayer, either for yourself or for someone else, pin a request on the board or contact us on-line and we will pray for the person named, in our services and in our private prayers.